Fewer Americans -- less than a third -- are making financial resolutions for the new year, compared to last year, according to the sixth annual Fidelity New year financial resolutions study. But for a little effort now, financial resolutions -- which were also found to be easier to achieve than losing weight or quitting smoking -- can pay off eventually. 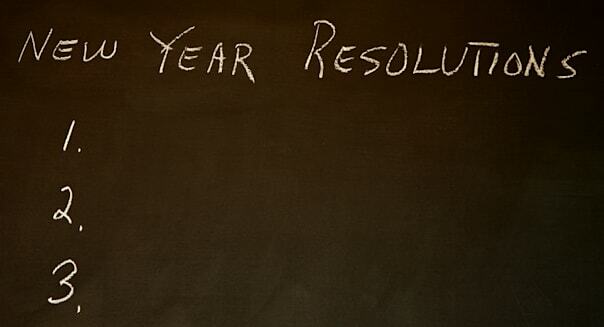 Surely one of these ten resolutions will improve your money life. The top three goals of those surveyed were saving more (55 percent), paying down debt (20 percent) and spending less (17 percent) -- all admirable and achievable. Of those who made resolutions last year, 74 percent, said they had made progress on those goals last year -- and 29 percent said they had achieved their goal. Set up anemergency fund first before anything else. While most financial planners advise saving from three to six month's salary, more is better. An unexpected trip to the emergency room or car repair can easily set you back thousands, and in this era of job insecurity a job loss can be devastating. Sock the money away in an inconvenient place like an online savings account so you won't be tempted to use it for a discretionary purchase. Paying down debt, even if it is difficult, will pay off for you more and faster the more and faster you pay. Pay down higher interest accounts first--and if you have a lump sum to contribute notify the creditor you wish you apply it to the principal. Vow to pay more than the minimum on credit cards. Createmultiple streams of income -- and I don't mean getting involved in multilevel marketing schemes. If you have a steady job, parlay a hobby or industry knowledge into side gigs or freelance jobs. Sell your unwanted possessions on eBay (EBAY) or your artistic creations on Etsy. Just don't neglect that day job as you pursue your bliss. Make aplaybook -- or in less appetizing words, a budget. Go through your checkbook and statements and see where you can pare things and what has to be prepared for. Also order a free credit report (you are entitled to one from each of the three reporting agencies annually) to see if there are accounts that need to be paid off sooner than later. Have the talk. This is the one most Americans find uncomfortable. Worse than the breakup talk, more awkward than the birds and bees but everyone needs to know the state of the union regarding debt, spending and saving just like the president's annual address to Congress. Another Fidelity study found families are not having the inter-generational talks about finances they really should have. This resolution is also highly recommended for engaged couples and newlyweds to head off trouble down the road. Ramp up your saving if you have an emergency fund and your debt is low. If your employer matches retirement contributions, get that free money. Check with your bank or credit union to see if it offers financial planning (many offer such service for free) or can recommend higher-yield places to sock away savings. Then, set up an automatic monthly deduction so you can keep your resolution. If you can, contribute the highest amount allowable to individual retirement accounts or other tax-advantaged savings plans. Get records organized so you can do things like file your taxes early. Using an app like Mint to keep things organized on the go can also help keep you on financial track with daily spending. Spend less is a popular resolution but too vague. Go through those statements and checkbooks and see where you can realistically cut corners. Getting an insurance audit to see if you are overpaying or refinancing a mortgage; get an energy audit to bring down power bills. Many websites -- such as DailyFinance -- offer practical hints to save on day to day expenses. Invest in yourself and take classes to get a better job or merit a raise. No one can take your education away from you, and it may even be tax-deductible. Learn about stocks and bonds so you can be a better investor and saver. Or invest in your own business. Make it easy on yourself and set up automatic bill pay and automatic withdrawals to help you achieve these lofty financial goals. Use a financial program like Quicken to get a big picture of your finances.